Also follow @1230games @warriors-fanatic @Pearlheart24 ! @Give_to_u @1230games @UltraDarioBros @DodsonFNAFgamer and @PumpkinKat129 voice acting THANK YOU! I have 77 followers! Can we get to 100? 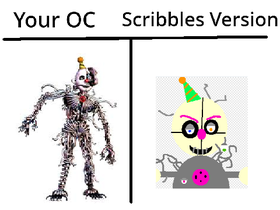 Add your OC and I will make Scribbles version! can we get 35 followers by the end of the year? 1,000,000 MANAGERS, PROJECTS, FOLLOWS BY 2020?!? can you make me blush, fall in love?